Happy 9 months at the bridge Smudgie! I hope you have tons of vanilla ice cream today and that you share just a little bit of it with all your friends. I know your heart is aching today as you remember 9 months ago. I just love that you light a candle for Smudgie on these anniversaries and I know she sees the light from it glowing all the way up to the bridge. As you always say, the love never ends and I truly believe that now. The legacies that our babies have left us will never die. Thank you so much for stopping by to wish my beloved Smudgie a Happy 9 months at Rainbow Bridge, I so appreciate your support, compassion and kind words. There is something so very spirtual and soothing when you see that beautiful glow of a candle. When I was a child, I remember I would love to go to church to see all the pretty lit candles. Now alot of the churches have the artificial candles where you just push a button and it lights up, I do realize that is safer but when I go to light a candle for Smudgie or any of my loved ones I go to a chapel that's downtown Manhattan and they still use the real candles, I just love that. I always light three, one special one for my beloved Smudgie, one for all of my lost love ones and one for all the beautiful furbabies that have crossed Rainbow Bridge. I know this may sound silly, but as I'm lighting the candles I get an image in my head of all of the looking down from heaven and seeing the glow of the candles, that image warms my heart. Thank you again for your sweet words and I believe that as well, our babies souls never leave us, the love never dies. Oh, what a beautiful letter to your Smudgie! As I read it, I could feel your pain and emotion and knew exactly how your felt. When you talked about the thought of loosing Smudgie entering your head, and immediately dismissing it because she was so young, I could related perfectly. I, too, had those thoughts and dismissed them since I thought I'd have Oscar many more years. It truly is like a nightmare and I'm sure there are times when you just can't believe that Smudgie is really gone. I really liked what you said about people who say they would not get a pet because the pain would be too great when they departed. I can't imagine not feeling that unconditional love for another creature that we here, have all experienced. Our sweet companions have given us so much and we are so blessed to have been a part of their short lives. Nancy, please know that I am thinking of you today and I wish Smudgie a very happy 9 month anniversary and know Oscar is sharing her tuna with Smudgie and Smudgie is sharing her vanilla ice cream with Oscar. Sending you a big hug, Nancy. Wish a happy 9th months with our beloved angels at the RB! it has been nine months and mom has been missing and thinking of you everyday! Her love for you is so strong that it touches our heart! You are one of the luckiest girls and you can tell your friends lots of beautiful stories of you and mom! these are sweet memories that will be lasted forever! I know how hard you feel at Smudgie's anniversary, whenever it hits, it would automatically reminds us how things were...Smudgie is so blessed to have such a loving home and a wonderful mom like you! You are in good hands as you have so much love in your heart! I know that your sweet Smudgie and her pal Oscar celebrated their anniversaries in style with lots of their favorite treats and activities! You have so many precious memories of your beautiful girl. I love reading about her special little ways and the things she would do that were so endearing...such treasures that mean so much more than any earthly possessions. Belated wishes sweet Smudgie on your 8 month Bridge day. I hope you had lots of delicious treats and a fun day with all your wonderful little friends. Your dear Mommy misses you so very much and you are always in her heart and thoughts. Sorry I am so late with my wishes for your precious Smudgie but I know she must have had such a beautiful day filled with so much love sent from you to her. Your letter to her was so touching and filled with so much love. I know how much your heart misses her and the emptiness you feel. I wish there was some comfort for all our broken hearts here, because the missing of our babies is so endless. It just seems most days like the years we had with our little ones flew by in a flash, yet the months without them seem so long. I will pray for some peace and comfort for your aching heart this Christmas and beautiful dreams of Smudgie for you to cherish. Your sweet girl loves you and misses you so very much. Sorry, I meant to type 9 month day. Evidently my eyes are worse than I want to admit! Happy 9 months at the bridge Smudgie. These anniversaries are so hard, remmbering the good times and the sad one. I know how much your missing your sweet girl and she is watching over you as you light her candle and everyday. Smudgie hope your day was filled with all your special things. Visit your mom in a dream she misses you so much. Dear Peg, Thank you so much for your kind words and for stopping by to wish my Smudgie a Happy 9 months at Rainbow Bridge. Yes you are so right, it certainly does feel like a nightmare, Smudgie always had health issues, but she always pulled through, but the cancer was stronger but God Bless her, my little girl truly put up a good fight.I miss her every day ! I was doing good for a few days, Christmas shopping, card writing, etc., I think "ok, I can get through this" and then all of a sudden I get this wave of sadness, the holidays are hard. I remember two years ago she was in the emergency hospital the day before Christmas Eve and I remember the doctor telling me they would let be take her home on Christmas Eve because the holidays wouldn't be complete without our pets to share them and now two years later she is not here and it just breaks my heart. It does give me comfort to know she is sharing her anniversary day and special treats with your beloved Oscar and all the other beautiful furbaby friends she has met at Rainbow Bridge. I also know this is your first holiday season without your sweet Oscar and I'm sure your going through the same emotions as I am, so please know I'm thinking of you and hoping the season passes peacefully for you. Much peace, comfort and continued healing and beautiful dreams of your sweet girl Oscar. Thank you for sweet words, they mean so much to me. It warms my heart to read the posting on Smudgie's thread because I feel it keeps her memory alive. Sometimes as the months fly by it scares me because I never want to forget any of her special little quirks, the funny things she did, the beautiful memories we shared, so whenever something comes to mind, I write it here to keep the memory save. Someday when I'm old and gray I will look back and read all of the posts and I'll smile and think what a beautiful life I shared with this very special little soul, we had it perfect for a while, she made my house a "home". It does give me comfort to know Smudgie is with your beloved Bedo and all of the beautiful furbabies of my petloss friends that I've gotten to know through their loving posts of their babies. I'm wishing you peace, comfort, healing and sweet dreams of your sweet adorable Bedo. Thank you for your kind words and for stopping by to wish my beloved Smudgie a Happy 9 months at Rainbow Bridge. You are so right when you said the bond we share with them can never be broken and it's not like any other love, the love we share with our sweet furbabies, is such a sweet, pure and simple love, they ask only one thing in return and that's to be loved back, that's all they want. I know my Smudgie is up there at Rainbow Bridge, running around with your sweet Bella and all of the other sweet furbabies and they are happy, healthy, safe and waiting for us, my mind knows this, but my heart has a mind of it's own, and just wants her back here again .....I just have to keep telling myself, someday.....someday we will be together again. I wish you peace, comfort, healing and sweet dreams of your beloved Bella. Thank you for your kind words and for always remembering my sweet Smudgie. Whenever I hear the saying "tomorrow is not promised to anyone" I try do things a little differently , and as you mentioned "it's very bittersweet". I think if we all remembered that saying, if it was our first thought of the day, we might love more, play harder, be kinder, not take things too seriously, laugh more, etc., but of cause, life gets in the way and we think "there is always tomorrow, we can do it tomorrow". I thought the same as you did with your beloved Bud, I would have many more years with my Smudgie, we would be "old ladies' together and when that wasn't meant to be it shattered my heart, my mind and heart could not imagine life without her. I kept thinking "It was too soon, she was too young, it wasn't fair, I wasn't ready for this", .......as if I would ever be ready for this. But now like you, I'm in a place where I feel blessed and fortunate to have been chosen to share my life with her, I still have my bad days, as I'm sure you still do as well, sometimes I feel like I take two steps ahead and one step back, but that's OK.....when you love someone as much as we do our furbabies there will always be good days and bad days but hopefully one day the good memories will out weight the bad days. I wish you peace, comfort, healing and sweet loving signs from your beloved Buddy. Thank you for your sweet posting, and please no apologizes needed, you are never late, I so appreciate everyone that posts a messages or just reads about Smudge, it warms my heart. You are absolutely correct, the years we had with our beloved babies just flew by in an instant, but the months we are without them seem so long. I did have a brief dream of her last night, in my dream she was zipping around the house, she was tiny and when she was running around it was as if she was almost flying. When I woke this morning it made me smile to see her again. Thank you for your prayers and comforting words. I wish you peace, comfort, healing and beautiful sweet dreams of your beloved Hunter. Thank you so much for your sweet post and for wishing my sweet Smudgie a Happy 9 months at the Bridge. You are so very right, the anniversaries are very hard and as that 1 year mark approaches, it actually scares me. I find it almost impossible to think that she is gone 9 months, but at least I can think "well this time last year she was here"....but once that 1 year mark passes, I can no longer say that, and that hurts my heart. As for Smudgie visiting in my dreams, I actually dreamt of her last night, it was just a brief dream, but it made me smile to see her again. I wish you peace, comfort, healing and sweet dreams of your beloved Max. Happy 40 weeks at Rainbow Bridge. It's about just about 12:05 P.M. Tuesday and I couldn't sleep, Mommy had a "sad" day. The holiday season is in full swing and Mommy is trying to just get through it and I was doing good, writing out cards, shopping, etc., but today all of a sudden I got this wave of sadness that I couldn't shake all day. I went shopping with your Aunt Jeannie we were having a good time, but I just couldn't shake the sadness. I came home, put all my shopping away, played with your sisters but still I couldn't shake the sadness. I think what I'm dreading most about the holiday is when I wrap the gifts, as much as it drove me crazy, I would wrap and you would unwrap, it made me smile and laugh, I just couldn't get mad at you, you were just so cute. You would dive into the wrapping paper and tissue wholeheartedly, tissue paper and wrapping paper would fly all over. I would pick you up and put you on the chair but your would jump right back into the middle of all the mess. Also, writing out cards is just not the same without you plopping on top of the card while I was trying to write it out and I would try moving you over and you would just move back or you would start nibbling on the pen. Thank you for stopping by in my dream last night, it warmed Mommy's heart to see that sweet face even though the dream was just so brief. I hope they have lots of tissue paper at Rainbow Bridge that you and your pals can play with and tear up, but if not, Mommy always has a roll waiting for you. Please come to Mommy in her dreams again, I miss your sweet face. Remember, Mommy's love will never end.......look for the candle later today and I will look for your special sign. Isn't it amazing how some of our best memories are of things that to some people would seem strange or even annoying? I know how much you miss Smudgie and these stories about the tissue paper and the cards, just like your other ones, are told from a perspective of deep and abiding love and remembrance of those happy times. When I was about six (and this is several decades ago) I had a bird who when he heard a potato chip bag, or anything that sounded like it, would go nuts until I let him nibble on a chip. All this time later I still look back longingly on those days and think of Pretty Boy. I do this with a tinge of sadness but mostly a smile, thinking of those times and that bird, long departed but all these years later never to be forgotten. I know he is waiting for me, and I hope he is getting all the chips he wants. Smudgie is likewise waiting for you, probably involved with some wrapping committee and eating vanilla ice cream. I hope this holiday season brings you the great gift of happy memories and dreams of Smudgie. I loved reading about your little gift wrapping assistant....I can just picture her going head first into the paper - that is so sweet... I like what Cal said about her being on the 'Wrapping Committee' - she enjoyed it so much - I think he is right about that. I believe Lee Lee is probably assigned to take care of all the cardboard rolls that the paper comes on....she loved those things... loved to carry them around for her great big 'pretties'. How much fun our babies must be having at the Bridge - don't you wish we could just take a little peek...just for a minute... and see what they are doing, especially at this time of year.... but I suppose we would never be satisfied with just one little peek would we? I know you miss her so much Nancy - I can't believe 40 weeks have passed for you.... I know it is cliche, but time really does seem to fly sometimes and at the same time it just feels like it is creeping along. What a very sweet story of your Pretty Boy, I could just picture this little sweet bird nibbling on a chip...how very precious. You are so right, what I wouldn't give to see Smudgie ripping up all the tissue paper and wrapping paper again, a lot of people would think I'm nuts but I just loved when she did this and even though it took me twice as long to wrap a gift, I wouldn't trade those memories for anything. I'm sure heaven had lots of chips for your sweet Pretty Boy and I'm sure Smudgie is enjoying shredding tissue/wrapping paper while they both wait for us. Thank you for the smile, I'm still thinking of your Pretty Boy nibbling on a chip, how cute. I would do anything to be able to take a peek at Rainbow Bridge, wouldn't that be just wonderful. Growing up I had a beautiful little dog named Max who loved the cardboard rolls as well, he would get so excited when he got one and he would run around the house with this big cardboard roll in his mouth, and he was just a little doxie so the roll was bigger then him. I'm sure Max and Lee Lee are taking care of the cardboard rolls as Smudge enjoys ripping up all the paper on those rolls. ...lol. You are so right time seems to fly by but on the other hand without them here it just creeps by. I can't believe it's getting so close to that one year mark, and come January is when she started getting sick, and it also would have been her 10th birthday, so my heart is just not handling any of this very well. The last few days I've been in Christmas overload trying to get things done, and I just try to focus on the moment, but when I sit down at the end of the day, I get hit with another wave of sadness, missing her so. And yes, I absolutely know what you mean about thinking of them but not "really" thinking of them......it's just so hard. I have a neat story to tell you, I went to a fund raiser for pancreatic cancer a few days ago and they had a psychic doing readings, it was a fairly large group of people and he walked around the room and he came over to me and asked me if I had lost a child this past year. I told him I lost my beloved cat who was like a baby to me. He then told me he kept seeing a garbage truck and whatever I threw out it was OK with Smudgie, not to feel guilty. I was floored, about two weeks ago my parents got me a new scratching post for my other 3 cats and I threw out their old one but I felt so guilty because the old one Smudgie just loved but it was in really bad shape and when I threw it out I felt so guilty. Nobody would know this other then me....and when I hear things like this I just have to believe their little spirits are still with us. Thank you always for your kind words, compassion and friendship. Peace, comfort and blessings to you my friend. Oh my goodness!!!! That is absolutely AMAZING - I got goose bumps reading your experience with the psychic!!! Incredible!!! I am so very happy for you Sweetie - that is proof that your sweet baby is still very, very near to you! What a wonderful gift from Smudgie to you for this first Christmas! I have thought about it a lot, and wanted to have a reading every since Lee Lee left, but I haven't for a couple of reasons... I hope that someday I am able to have it happen. I am thrilled for you my friend!!! I believe too!!! Your little dog Max sounds so sweet and happy - I could just see him racing around with his cardboard roll - Lee Lee could get pretty wild - sideswiping the tree and anything on the coffee table - but it was all good - I loved to see her so excited. My heart is with you as Christmas approaches...I know exactly how hard it is to 'hold up', when all you want to do is just collapse into tears. I will keep you in my prayers for peace and comfort - I know her birthday and the weeks ahead of her 1st anniversary will be so difficult to get through...the memories are just heartbreaking... but your sweet little guardian angel will be right there beside you. Awww, thank you so much for your sweet posting. I wasn't going to go to the fund raiser, my heart wasn't in it, but I lost a very dear friend and also my beloved Smudgie to this horrible disease so I felt like I needed to go. I have to say I'm glad I went and I also got goose bumps as well when he me told me "whatever I threw out it was OK with her". I heard the words but I just couldn't believe he said them. Thank you again for your prayers, compassion ,comforting words, and friendship you will never know how much they mean to me and how much I've healed because of you and everyone else that have reached out to me. You are in my prayers my friend and just like my little guardian angel is right beside me, your little guardian angel is right beside you sending you all the amazing heart signs. During this magical time of year I'm wishing for you a very special heart sign from Lee Lee. Well Smudgie, it's just after midnight which means it's Tuesday and come 8:30 a.m. it will be 41 weeks that you went on to Rainbow Bridge. I'm trying to hold it together sweetie, getting things ready for Christmas, but I still haven't been able to get out the big box of Christmas stuff. I remember how much you loved that big box....it was so magical to you, it was full of all sorts of shiny ribbons and tissue paper and wrapping paper and I can still picture you diving in head first with only your back end sticking out of the box. You fur was white as snow but you had a black tail and that's all I would see sticking out of the box and no matter how many times I pulled you out , you would jump right back in, it made laugh every time. This year, Mommy is leaving the big box under the bed, my heart couldn't take opening it without you here. I actually went out and just bought stuff I needed and maybe next year I will open the box .......or maybe not. Your sister Calie made me laugh today. You know Mommy still has your little bed in the same spot you left it and Calie who is twice your size actually squeezed into the bed this morning, she looked so cute even though most of her was spilling out over of the edges. It's funny in all the years we had that little bed, this was the first time she decided to try it out.....unlike you who took every opportunity to sleep in Calie's bigger bed while Calie moaned and groaned at you to get out. You had the face of an angel but you also had the mischievous little devil horns when you wanted your way, Mommy always said you had a "strong personality" and I wouldn't change a thing about you. Enjoy your day sweetie, have your vanilla pudding or ice cream and be a good girl and share your treats with all of your Rainbow Bridge buddies. I miss your face rubs.......I would give anything to feel your sweet face rubbing against my cheek. Don't forget look for the glow of the candle that Mommy will light for you today at St. Paul's chapel. Mommy is off from work today, trying to get things done for Christmas, but so missing having you here. You would be right in the middle of everything causing havoc and Mommy would be loving every minute of it. This is my first Christmas without you here and Mommy's heart is so sad. I wanted to include you somehow this year, so I sent out Christmas cards that had a beautiful red cardinal on the card. Since you passed Mommy has seen a red cardinal a few times on very specific days, so Mommy calls the cardinal "Smudgie's cardinal", thank you for sending him. I know someday we will be together, and I know you watch over me and your sisters, but I so miss having you here, I always thought me, you and your sisters would grow old together. When you left for Rainbow Bridge I felt like the light in Mommy's heart went out. I miss you sweetie.......I miss you forever. I read your post about the psychic - that is just truly amazing and a great affirmation that Smudgie is still near and watching over you. The comment about the red cardinal appearing is another sign. I had heard a while back that whenever you see a cardinal it is a loved one that you miss who is stopping by to pay a visit. I really believe that too. Wishing you a little peace for your heart this holiday season - I know how rough it is for the first Christmas and for me it will probably be rough every Christmas. The psychic was so on target with that, it was something I never mentioned to anyone and I felt so bad throwing her scratching post out, it really bothered me and for him to have picked that up was amazing, not only for me but for all of us, it confirmed to me that they are still with us and watching over us. I also heard that about the cardinal as well and the first time I saw "Smudgie's cardinal" was the day after she passed. My other cat Sparky was banging on the window and I was lying in bed so vey sad and told her to stop but she continued so I got up and looked out the window and a beautiful red cardinal was sitting on the fence, over the past 9 months I've seen it just a few others times but it was always around "specific dates". I wish you peace and comfort as well during this holiday season and sweet dreams of your beloved Brandy. I love reading your sweet letters to Smudgie. They are always filled with such touching words of love. I know how much your heart aches. It is just so endless isn't it? Your story of the psychic was truly amazing. It brought chills to me reading that and also about the red cardinal. after my father passed away in 1983 my mom would always say this blue jay that would come all the time and sit on our front porch was my Dad coming back to see her. That blue jay would just sit there so intently and my brother and I thought it was the strangest thing but of course we would tell her she was delusional (lol). Well when my Mom passed away in 1995 that afternoon after returning to her house from the funeral...there sat two blue jays together on the porch. We continued to see them the whole time we were there off and on over the course of the next week. A couple of years later when I had to fly back to Arkansas to sign the papers to sell the house, as my brother and I walked out of that empty house that had been our home for so many years, there sat 2 blue jays on the front porch railing. I like to think that was indeed my Mom and Dad letting me know they were all right. I think Smudgie is letting you know everything is o.k. when you see the cardinal. I hope your heart can find some peace and comfort this Christmas, though I know you will be missing your little one so very much. Tomorrow would have been Hunter's 13th birthday, so am dreading the day. Thank you so much for the kind words and for reading my posts to Smudgie, I feel like everytime someone reads my posts to her it keeps her memory alive. What a beautiful story about your parents, they wanted to let you and your brother know that they are together and OK and always watching over the both of you, I love that! I've come to realize life is not all black and white, there are things in life that we just can't explain and that's OK because it also gives me hope that there really is something beautiful after this life and we will see our love ones again. I just looked at the clock and it's just past midnight, which means it's your beloved Hunter's 13th birthday. It would have been my Smudgie's 10th birthday next month on January 8th and I'm so dreading that day as well, so I know how you are feeling. I hope the day passes peacefully for you and I hope the beautiful memories of your Hunter bring you a bit of comfort. Please know we are all here for you, I will light a candle and say a prayer for your beloved Hunter's birthday . I wish comfort for your heart and beautiful sweet dreams of your Hunter. Hunter, how 13th birthday sweetie - may you have a wonderful celebration at the bridge. Please come to your Mom in her dreams, she loves and misses you so. your letters to your sweet Smudgie touch my heart each time I read them. Your beautiful baby will always be with you and her memory will always be kept alive. Hopefully she will visit you on Christmas and maybe even find a way to go in the big box under the bed that she always liked so if you here any noises u will know it was her letting you know she was there. Your story about the Psychic was awesome it proves more and more then that the bond will never break and the love will never die. Smudgie is with you forever. I wish you a blessed Christmas filled with many sweet dreams of your baby although your heart hurts for her I hope you find peace and comfort with her spiritual presence. Thank you so much for your kind words, your post made me smile. As they say Christmas is a magical season and any thing is possible, so I will be listening for any noise coming from under the bed... :). The Psychic was pretty amazing and afterwards I got a chance to tell him that, but he told me it's our loved ones that should get the credit, he is just the messenger and if we can remain open we all can see their signs and hear their messages ourselves. I wish you as well peace and comfort for your hurting heart, a very blessed Christmas and beautiful sweet memories of your beloved Bella, remember she is always by your side. Today of all days, I appreciate so very much your sweet words of kindness and comfort both here and in the touching message you sent me. It truly is such a huge blessing to my heart to have someone who understands all this heartache and truly cares. Our precious little ones are such a huge part of our lives and the hole they leave behind is so immense. Thank you for always being there with such sweet words of comfort and love. I hope your Christmas ,as hard as it will be without your precious Smudgie, will still bring you blessings of peace and comfort to your heart. You will be in my thoughts and prayers. Thank you for your kind words, support and compassion, they mean the world to me. You're in my thoughts and prayers as well. Happy 42 weeks at Rainbow Bridge Smudgie. Well it’s Tuesday, another Tuesday and two days before Christmas, just 8 days before a new year starts, 3 weeks before your 10th birthday and just 10 short weeks and a few days short of your 1 year anniversary. Mommy’s heart is hurting and Mommy would love to fast forward to spring but I’ve come to realize no matter how much time goes by or even if I could fast forward my life it wouldn’t matter because no matter what, Mommy will always miss you but more importantly, Mommy will always love you. Today I want to remember all the times you made me laugh, you had the cutest personality. Yesterday I came across this photo, I like to call it hatching lemons, not sure why you did this but every time Mommy would buy a bag of lemons you would sit on them. Everytime I look at this picture it makes me laugh and it also brings back fond memories of kissing the top of your little head. You also for some strange reason loved celery, you would dive head first into the grocery bag trying to get at the celery. Mommy would pull off a piece and would you just kinda hug the celery stalk, not sure why you did this, but it always made me laugh. Sweetie, Mommy wants you to have fun today with all your special Bridge Buddies and enjoy all your special treats. I know in my heart someday we will be today, but until then please keep sending Mommy all your special signs. I went to last nights candle ceremony and I hope you and all the other Bridge Kids could see the soft glow from the many many candles lit for all of you. This morning I lit your special candle at St. Pauls chapel and I hope you heard me whisper " I love you". Remember Smudgie, your heart is in my heart, where I go you go, Mommy's love will never end. 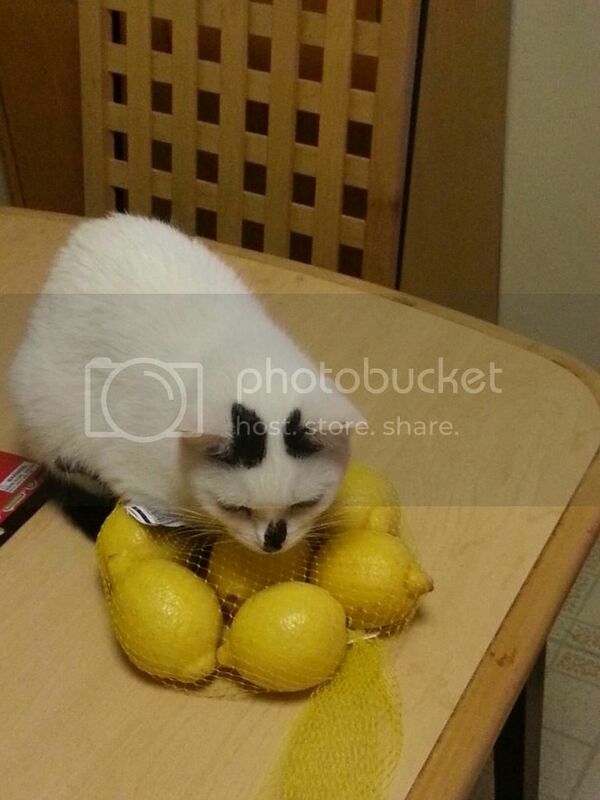 Oh Nancy, what a sweet picture of Smudgie and her lemons. The funny things that our pets do can give us such joy and laughter. I'm sure Smudgie loves the soft glowing light from the candles that you always light for her. She can feel her mommy's love and is waiting for the day she will be with you again. Have a blessed Christmas - you and Smudgie are in my thoughts and prayers. I love that picture. It makes me think of that old saying, when life throws you lemons make lemonade. But that's why cats are so awesome-they don't care about stuff like that and instead truly march to their own drummers. Those of us who have cats know how lucky we are that they let us into their lives. I wish you many more joyous memories of Smudgie in the days ahead. I was feeling so sad, this is my first Christmas without her and then I came across this picture and she had me laughing through my tears. She did such quirky things and no matter how bad a day I was having she knew how to make Mom laugh. Even now she knew I needed a smile and I found this picture of her. It's very funny, she did this every time when I bought a bag of lemons, I remember buying a bag of limes and she gave them a sniff and walked away. The next time I bought the lemons she sat right down on them......you know, I haven't bought a bag since she passed. Sometimes I'm in the produce aisle and see them and i get all teary eyed. I sometimes wonder if anyone saw me getting emotional over a bag of lemons what would they think...lol. I hope you have a blessed Christmas as well and I will keep you, Angel Brandy and sweet Miriam in my thoughts and prayers. Awwww, thank you, that picture always made me laugh. I was feeling so sad, this is my first Christmas without her and when I came across this picture she had me laughing through my tears. And you are so right, they truly march to their own drummers. Smudgie had so many funny quirks and no matter how bad of a day I was having I could always count on her to make me laugh. And yes we are so lucky when they let "us" into "their" lives. My brother was living with me for a short period of time after losing his home during Hurricane Sandy and he had never had cats before, well you would have thought he won the lottery the way he acted the day Smudgie finally "allowed him" the honor of her sitting on his lap. Here is this big guy well over 6 feet and this little 5 lb cat and he wouldn't move a muscle once she got comfortable on his lap, he was so funny to see. What a precious photo of your baby! I love it....what a great personality she has...lemons and celery....you must have loads and loads of the sweetest memories! I'm sure that your little girl had a wonderful celebration for her 42nd week....I'll bet she has her very own lemon tree at the Bridge! I'm so glad she sent you a Christmas smile...she loves her Mommy so much! I've been meaning to tell you (and Pam) that I really enjoyed the story Pam shared with you about her parents and the blue jays that visited their porch - that is a beautiful message isn't it? Have you had any more visits from Smudgie's Cardinals?